Medium shrub with an upright growth habit. It has rounded grey-green leaves. 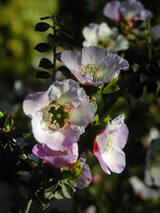 The large 5-petalled single purplish-pink flowers have a green centre. They are full of nectar for the bees. This plant can be expected to be a hardy shrub for moist soils in temperate climates. Plants prefer full sun or partial shade and may be pruned severely if necessary.